CREST Foundation is pleased to announce that scholarships were awarded to 19 bright and deserving students for the 2011/2012 school year. Since 2008, CREST Foundation has awarded $455,000 in college scholarships to 68 students. The rising cost of tuition has made it a struggle for most families to pay for their children's college education. Many of our awardees come from families with two or more children enrolled in college at the same time. With family budgets tighter and loans and grants harder to come by these days, programs like CREST Foundation are more important than ever. CREST Foundation needs your support to continue funding these essential grants and to give our industry's kids a chance to pursue their educational dreams. This year's awards go to Brittany Pham, Javiar Arias, Antonio Williams, Stephen Beck, Morganne Hester, Ashley E. Clark, Melanie Ferrara, Sarah Murtha, Delane Jordan Bass, Jami Saladin, Emmalee Nikolas, Sara Taylor, Angela Lopez, Emma Garza, Kevin Forge, Ashley Schifano, Alexandra Iorfino, Kelcey Heman, and Mackenzie Heman. These ambitious and dedicated students are all children of parents who have worked in the reprographics industry for five years or more. Their parents are employed by A&E – The Graphics Complex; Acme Blueprint Co., Inc.; ARC; Capitol Blueprint; City Blue Print Co., Inc.; City Blue Technologies, LLC; Document Imaging Systems; Duncan-Parnell, Inc.; HB Digital Arts & Blue Print; Lynn Imaging; NRI; Thomas Reprographics; and Triangle Reprographics. 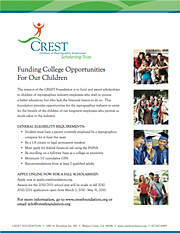 For more information, visit www.crestfoundation.org or email info@crestfoundation.org.